Life with Giggles: This girly girl went to a demolition derby and loved it! This girly girl went to a demolition derby and loved it! 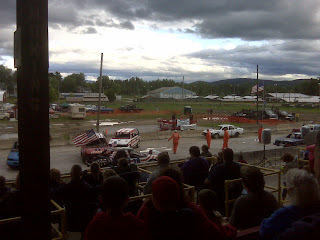 While we were in Vermont for the holiday weekend, we went to the town of Rutland to see the annual demolition derby! Pardon the picture quality but it was taken with my handy dandy blackberry! I am not sure why the crashing and slamming of cars into each other is so exciting to me, but it is! I get extra excited when I heard the loud crunching of metal when one car goes full speed ahead to it's enemy! 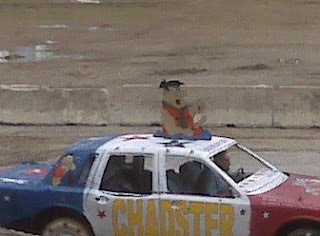 Might not be too clear, but his hand is stroking a "stick." HILARIOUS , to us of course, and maybe you are giggling right now too. You have to admit that it's pretty funny that this car was being smashed around and all you can really look at in shock is the ornament this guy decided to put on his car. He got all of our attention!